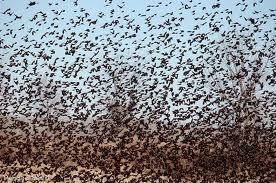 The bizarre night in Beebe Arkansas when thousands of birds fell from the sky. For as long as anyone can remember, there’s been nothing strange about that, the birds like nesting in their trees, but on New Years Eve 2010 the birds started raining down on the town. “They were just kind of dead everywhere – it was very bizarre” says local resident Kerry Mayo. 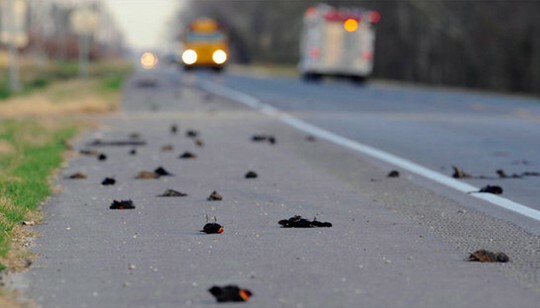 Between 10 at night and 4 in the morning, 5000 blackbirds fell out of the sky for no apparent reason. As dawn broke hours later, the scene was bewildering. It was, dare we say, an aflockalypse. “We started then thinking this was some type of biological attack where we needed to be worried about going outside” says local wildlife expert Kelly Mayo. Although no evidence of a biological attack had emerged – a growing army of townsfolk and TV crews were looking up to the heavens for answers. And whether this was a sign from God. But wildlife experts, like Karen Rowe from the Arkansas game & Fish Commission had already started looking for more down to earth explanations. 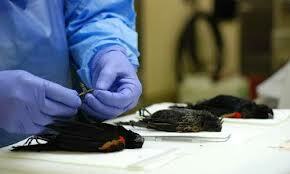 The necropsy results quickly eliminated the contagious avian diseases – the birds were clean. But then Karen Rowe noticed something very strange. “These birds were in very good health, good body condition, all their organs were in great shape but they had suffered blunt force trauma and died from that,” she says. But death by sudden impact seemed implausible. Flocking birds are able to react to sudden changes of direction in as little as 67 milliseconds. “The disadvantages to being in a flock is that if there’s an accident, if the flock itself encounters some sort of obstacle, then the entire flock goes down because they’re moving as one organism, they die as one organism,” says Rowe. And there was one key feature to the mystery that had so far been ignored – the incident had happened at night. And black birds can’t see at night so its unlikely they would have been flying. “The evidence was for some sort of disturbance at the roost, causing the birds to leave then be unable to negotiate and fall and collide to their death,” says Rowe. Something had caused blind panic – literally – amongst the giant roost…but what ? A thunderstorm was the obvious culprit…. But it looked like the answer had been staring them in the face all along…. And if more evidence were needed – on New Year’s Eve a year later, more fireworks were set off – and more birds fell out of the sky. So in Beebe the mystery of the birds still has wings. Nice article. It will aware people that they should be friendly to their environment.